If you love kids, nature, and gardens, then you will love this wonderful free publication developed by the National Wildlife Federation and the (NC-based) Natural Learning Initiative. Nature Play At Home, A Guide for Boosting Children's Healthy Development and Creativity is a free, downloadable, printable PDF booklet. In Nature Play at Home, parents and caregivers will learn how (and why) to create wonderful Nature Play Spaces TM for children. 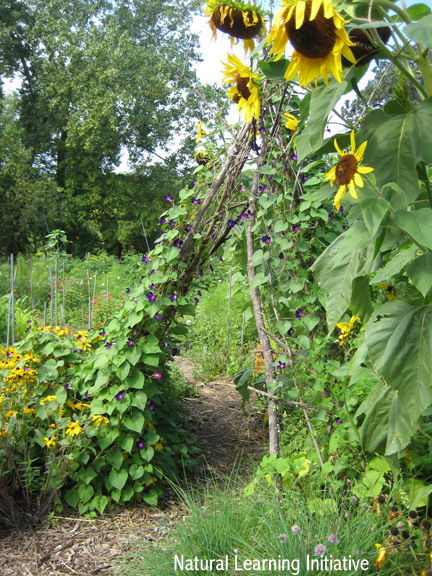 Projects--which are ranked by difficulty according to the number of "shovels"--include creating a sensory garden, an edible garden, a vine teepee, a water garden, balancing logs, grass mazes, dedicated play spaces for sand, water, mud, and acoustic play, and a miniature fairy village, among others. Click here to download the booklet (you will be asked to provide your first and last name, email address, and zip code). Here in NC we are expecting warm weather tomorrow; why not take advantage of this opportunity to spend some time outside with your kids? Please note: I have used the vine teepee photograph with permission from the Natural Learning Initiative. Please do not repost or reproduce this photograph without their permission.